March, April, May SALE from $275/n 2pp. Spectacular Ocean & Mtn views. 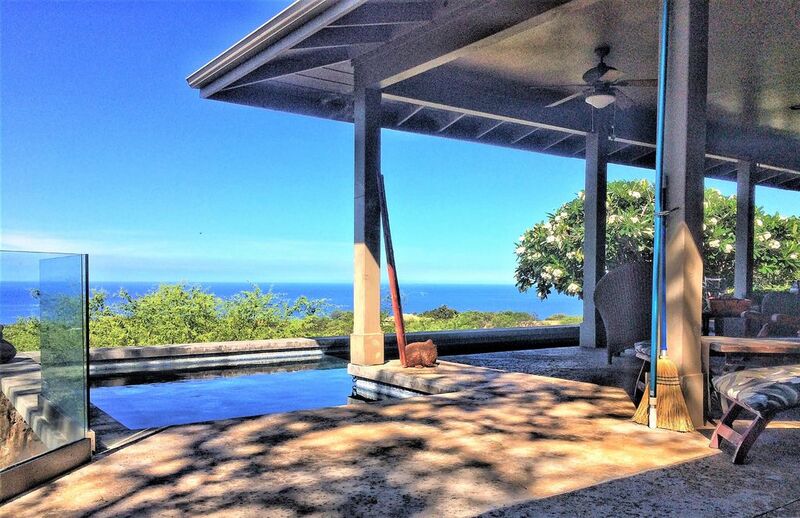 Ocean and Mountain view home on the Kohala Coast perfect for couples. This beautiful home is located on the Big Island, Hawaii's famed Kohala Gold Coast. Take advantage of low rates in a great location while visiting our special island. Instant booking is for a maximum of two guests booking the home with one master suite only. If your group is larger inquire for assistance. This home is perfect for couples looking for a peaceful place to enjoy a great vacation. Imagine relaxing by your own private pool, on your own lanai, looking at a sweeping ocean, coastal and three mountain view. No hotel crowds here. Your own home. Complete privacy, peace and quiet. All just minutes away from the island's best beaches, golfing, restaurants and shopping, and an easy drive to the island's top attractions. This is a single home and only one booking group is reserved at a time. You will never share with another rental guest. After you book, friends may decide they want to tag along. That's fine up to a maximum of two additional guests and one additional room. You can add a room at any time up to check-in date if needed. An added room for added guests will incur an added fee. Please inquire for pricing. Please note, square footage quoted is the entire home to offer an idea of home and grounds - ie; this is a single family home on a gated 3 acre parcel. As your rental is for less than the full home the interior square footage accessible to you will be less. Many of our guests love Laughing Gecko Lodge so much they come again and several have confessed it is the best vacation rental they have stayed in. Please note, this home has ceiling and floor fans. It does not have air conditioning. Living room and main master bedroom have TV. Please don't hesitate to contact us, without obligation, for more information. Per HRS ACT 204 HI TA tax ID# is displayed in the rental and provided to renters upon request by contacting the owner/manager. Please note Hawaii County zoning law permits short term vacation rental (STVR) use in areas zoned "Agricultural" where the property is a 'hosted rental'. Caretaker on property; please inquire for details. Please note, guest occupancy of the home is limited to the rental group only and the home is not intended for use as an event space for reunions, weddings, group entertaining, business entertaining, parties, etc..
Ali Blackmore has traveled the globe, living in eight different countries over four continents. Dual careers in real estate and design have traveled with her and continue on Big Island, Hawaii where she works in real estate & design specializing in Kohala Coast property. Ali bought her home because it is one of the all-round best view lots and locations in the Heathers at Kohala Ranch. If you are visiting Big Island to look at or buy property Ali would be delighted to assist you with your search or purchase. Growing up on a large ranch in Central Africa, when Ali arrived in Hawaii she found a place that was so strikingly similar to her 'home' that she fell in love with the area. The location struck an emotional chord and met a career goal at the same time. Quite simply, the Kohala Coast is the most popular place to vacation on Big Island and the Heathers at Kohala Ranch is one of the nicest spots to stay. Guests love the home and the views and Ali loves sharing this beautiful place with them. One of the best aspects of renting this home, especially for couples, is the affordability. For couples this means paying just for two, but enjoying all the benefits of the entire property without the cost. It's a perfect place for enjoying your vacation; quiet, private, beautifully designed, and with exceptional views. Located just minutes from beaches, golf, dining and shopping, all a holiday-maker needs is close at hand but can seem a world away when it's time to relax and get away from it all. Often when guests settle in to the outdoor living room on the lanai and look at the view they never want to leave or do anything else. Yes, it really is that spectacular! There are two full and one half bath. The two full baths are en-suite to the 2 master bedrooms. The half bath is located at the home entry for visitors so en-suite baths remain private for renters. App 2 miles to the coastline as the crow flies. Drive to the island's best beaches in app 10 minutes. Kohala Ranch is a private gated 2 thousand acre ranch with residential homes and free range cattle at times. The setting is peaceful and rural, yet, the location is just minutes from towns & resorts. The best views available in the Heathers. Ocean, coastline and mountains. The views are just stunning. Dedicated to home / not shared. 100% cotton for home and beach. The home does not have AC. All rooms have ceiling and floor fans. Large built in above wall oven. Large kitchen with gas range, LG fridge/freezer, standard small appliances, large walk-in pantry, all necessary utensils. One TV in the living room. One in the master bedroom. Large selection of owner's books to read but please do not remove. Home is surrounded by sunny and shaded lanais. We do have boogie boards and some snorkel gear but recommend you supply your own snorkel gear. Tennis is available at the resorts just down the coast. Many of the island's best golf courses are just minutes away by car. The main house is all on one level with wide doors and should be accessible. Bathroom has walk-in shower with a 3' plinth. 40' pool edges the main lanai with incredible ocean, sunset and starlight views. Caution needed with small children. No events. No parties. For guest residential rental purposes only. Beautiful views, peaceful and every amenity you could possibly need. Stunning. If you are looking for serenity, beauty and complete relaxation, this place is for you. There are neighbors but nothing really close and you feel like you are the only people for miles. We took walks with AMAZING views. Go early or late because the mid-day sun was brutal with those steep hills. (We went at 11am ...once) You can see gorgeous mountain and ocean views both from the house and on our walks. The house itself is so well equipped, it was easy to cook or grill out for every meal, but don’t. There is a surprisingly good restaurant for such a small town just down the hill from the house, The Seafood Bar & Grill. Try the Black Bean Seafood Combo, not many black beans so we couldn’t figure out the name but who cares because it was one of the best seafood dishes I have ever eaten. I would recommend The Laughing Gecko 100% with zero reservations. My husband and I rarely return to the same locations with so many places in the world to explore but this property now has a special place in our hearts and we look forward to returning. Ali, thank you for a truly unique and wonderful stop on our vacation. We (my wife and I) had the pleasure of staying at the Laughing Gecko for five days, and enjoyed the home immensely. The view is spectacular as all of the homes in Kohala Ranch are on large lots, and there are uninterrupted views of the island and ocean (elevation approximately 800-900 ft). This home is the perfect place to relax away from the resorts, quiet beautiful sunsets, star filled nights, a pool to relax in, what more do you need? The beach? Spencer Beach is only a ~10 min drive. The home is the best equipped home for cooking that we have stayed in to date, so entertaining larger family gatherings would be very doable. On the whole, an awesome place to relax and enjoy island life. I just cannot say enough good things about this house, if you love peace and quiet away from the resorts, this is your place. Tucked away on a private culdesac in the private gated community of Kohala Ranch with views that go on forever. Beautiful sunsets. Clean, well stocked kitchen and pantry. Great communication with owner. This is our 9th trip to the Big island and we would definitely book again. Thank you. Yes, it is. Fantastic views in a quiet neighborhood. Excellent kitchen and amazing pantry (I want this pantry!). We went in the pool everyday and sometimes forgot to even leave the house because we pool lounged all day. The pool is not heated but we found it as warm as houses we rented where the pool was heated - it was the perfect temperature! This house is located in the best part of Kohala Ranch (the Heathers - good weather and close to the best beaches). We'll be back! Observatories / Star gazing, Botanical Gardens, Historic Homes, ATV Tours, Farm tours, Whale watching, Sailing, Zip line, Jungle hikes, Waterfalls, Swim with dolphins, Caving, Zoo. Instant Booking and rates quoted are for 2 people only using the main house & master suite. If your group is larger please inquire with the owner. You do not share the property with anyone else. Ask about rates for additional rooms/guests. Fees are subject to change. Inquire about last minute (same month) discounts. Cleaning fee depends on number of rooms used. Rate quoted is for 2 people using the master suite.